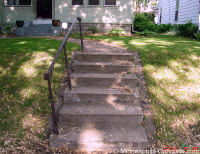 Concrete steps are probably the most strong and durable option for stair building materials. They are used to connect the front doorway of a building to the sidewalk. They are also commonly used to connect a sliding glass door to a patio below. 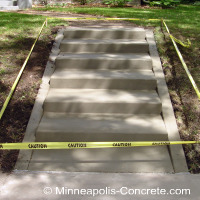 Steps are usually installed in conjunction with sidewalks, landings and patios to assure a good color match of all the concrete on your property, as well as best price by your contractor. 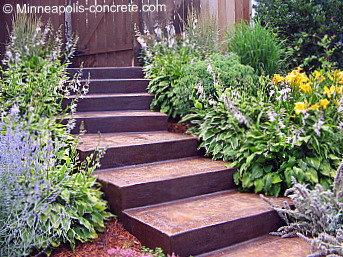 A beautiful landscaping option is to install concrete stairs to connect a higher elevation to a lower one. This is common in backyards that have a walkout. In the picture below, Cornerstone Custom Concrete formed a curved set of concrete stairs down the side of a hill so that people entering the backyard do not have to walk down the sharp incline. These stairs were first installed with standard concrete. Initially, the homeowner just wanted a way for walking traffic to descend down a hill gracefully and safely. 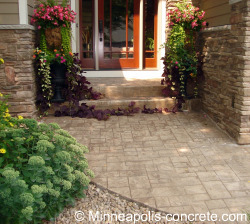 Later, the homeowner decided to update the area with more color by installing various flowers and plants as well as coloring the concrete with an acid stain. Additionally, the concrete was sealed to keep the color brilliant and the concrete protected from the elements. If you know you will want color in your project at some point, it is best to have the color mixed integrally throughout the concrete with the initial pour. Although it may make the project cost more initially, it is cheaper to color first than bring a contractor out later to color the surface. In addition, if the concrete chips, white concrete won't show through as it will with staining. If you are a do-it-yourself type or want to know more about the installation process, get directions to building concrete steps here. 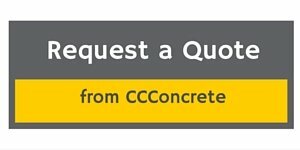 If you live in the Minneapolis and surrounding suburbs area, request a bid for your concrete project.